The 27 mil Ansell Chemi-Pro Neoprene Latex Glove is made of a combination of natural rubber latex with a neoprene coating for added protection against chemicals which increases the durability of the glove without using heavy gauge nitrile which could be more costly. 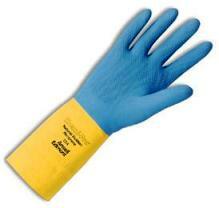 For added comfort the glove is cotton-flock lined which also absorbs perspiration. The Chemi-Pro glove is designed to be used on wet or dry surfaces which is why it has a diamond embossed pattern that provides added grip.